Ultima V, Warriors of Destiny, is always in a close contest for my favorite Ultima game. This was the first Ultima I actually bought with my own money. That was a whole lot of lawns mowed. This is my sixth post in my series of how to play all 14 Ultima games on a modern PC. We return to DOSBox for this one and again I won’t get into acquiring the game files, installing DOSBox or justifying why do this myself when I could just get the games via GOG. Please see my first post, on Akalabeth, for my comments on those things. For previous posts in the series see: Ultima IV, Ultima III, Ultima II, Ultima I and Akalabeth. 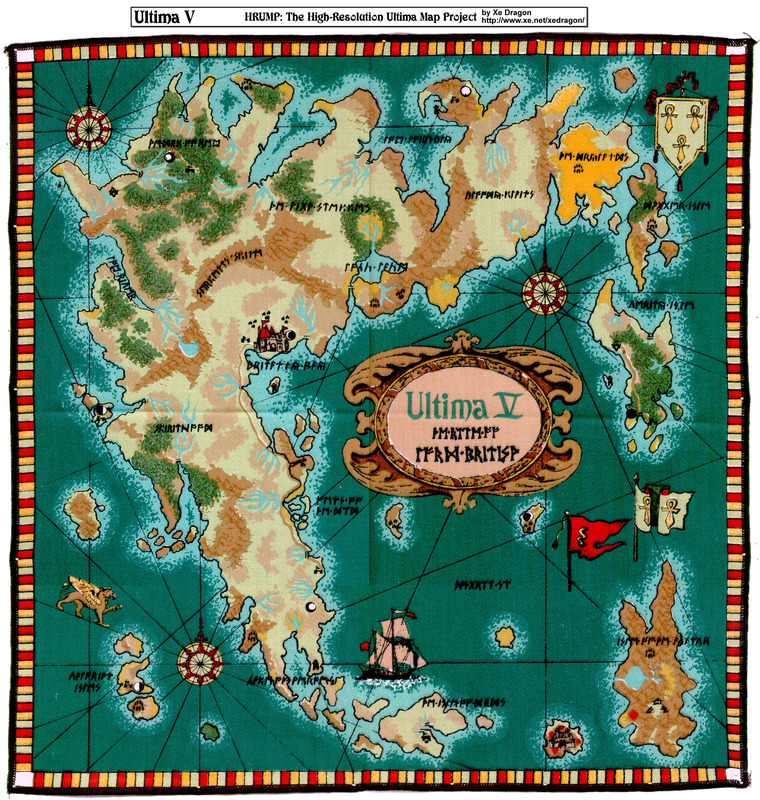 The High-Resolution Ultima Map Project is the best place to get most Ultima maps and here is the link for the Ultima V map. Next is the manuals. Ultima V comes with four pieces of documentation: The Book of Lore, the Underworld Journal, a Player Reference Card and a Quick Reference Card. The Book of Lore, the Underworld Journal and the Quick Reference Card can be found at replacementdocs.com here, here and here. Again, I have no clue where I picked this up, but here is a scan of the original MS-DOS Player Reference Card. Simple. Copy all the game files to your machine. Choosing a path that only contains folders with less than 8 characters and contains no spaces will make your life easier in the next step. For reference, I always choose “C:\Games\ultima5”. We are going to install The Exodus Project’s Ultima 5 Upgrade patch. The primary purpose of the patch to add the musical score that was available on the Commodore 128 and Apple II. This was a HUGE reason I always wanted an Commodore 128. Sadly I never got one. Back to the task at hand. Download the patch from here. Copy the contents of the zip file into C:\games\ultima5. Choose “replace” when it asks. The upgrade requires CWSDPMI, so download it here. Copy the contents of the bin directory inside the zip file into C:\games\ultima5. Now execute the following in DOSBox. Scroll down the list, select "SoundBlaster or compatible" and press Enter. Hit 'y' to test the sound. The sound test should play some music and hit 'y' to exit. Hit '2' to save the configuration and exit. You will not need to do any of this again, unless you want to mess with the music or soundcard settings. For the most authentic feel reduce the cycles with Control-F11 until the cycles is ~500 (I actually prefer it a little higher at ~800). Again control-F12 increases the cycles and Alt-Enter puts DOSBox into fullscreen mode.